The Forest Service began building trails in the 1890s, when the national forests were first set aside as forest reserves. Those trails were not scenic walks, but designed as the quickest way between two points and built primarily for communication and fire fighting activities. Random trails created by the consistent use of visitors to access scenic areas were not of much concern to the early Forest Service. Foresters and packhorses ready to hit the trail, Okanogan National Forest, Washington, 1909. In the days before telephones and radio, Forest Service trails were the means of communication between remote stations. Travel and communication was done primarily by horseback, and packhorses were used to deliver supplies to distant lookout towers. Especially during fire season, efficient trails were essential to move men and equipment quickly. The value of the road and trail system to the Forest Service was recorded in each yearly Report of the Chief, the annual report of the Forest Service. Included were the amount of road and trail mileage constructed that year, the total miles of roads and trails, and the distribution by state of the budget appropriation for roads and trails. Many large areas are still entirely without even the simplest trail facilities. Valuable forests which will be urgently needed in the future are being jeopardized by reason of the fact that they are without adequate roads or trails by which fire-fighting supplies and men may be brought in case of need. Clearly the recreational use of trails was beginning to be a consideration in trail planning, although to a limited extent. 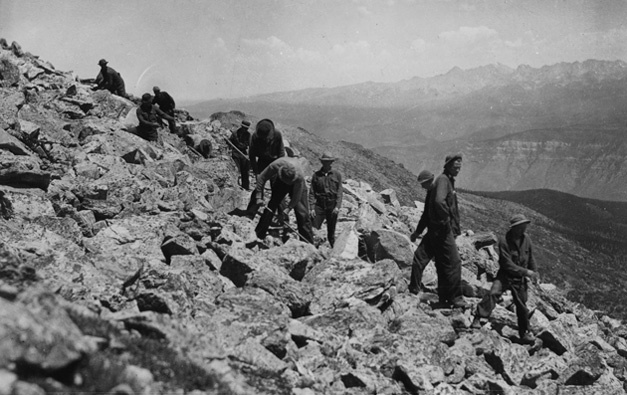 CCC crew at work on trail to top of Notch Mountain, Grand Mesa National Forest, Colorado, 1933. The following year saw extensive infrastructure improvement and construction by the Civilian Conservation Corps and other work relief programs of the Depression era, which would continue into the early 1940s. Among the many construction efforts undertaken were trails designed specifically for hiking. A 1934 plan described the aesthetic goal. 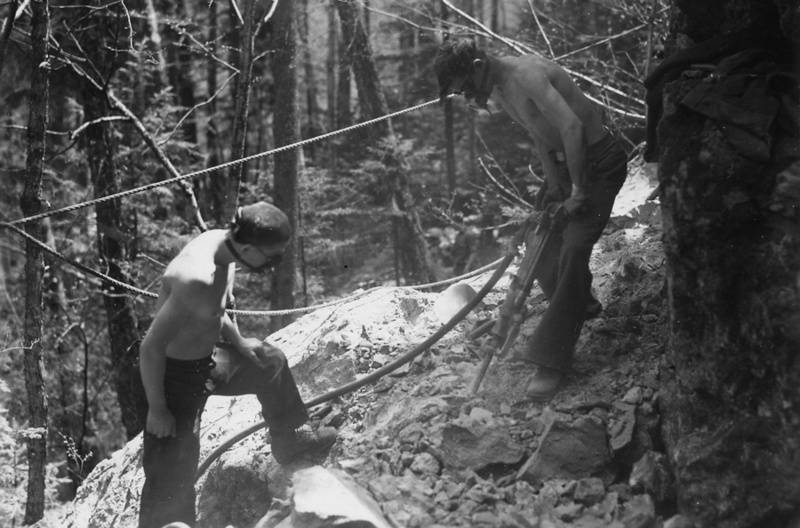 CCC enrollees at work building the Glen Ellis Falls Trail in New Hampshire, 1938. During the era of relative prosperity of the 1950s and 1960s, the popularity of hiking continued to grow. Demand for all aspects of outdoor recreation was surpassing the available resources for national as well as state and local governments. In 1958 Congress formed a special commission, the Outdoor Recreation Resources Review Commission (ORRRC), to take a comprehensive look at current recreational resources as well as future needs. The commission spent three years gathering data and studying trends, working with local and state governments to survey existing recreation resources. America must not neglect its heritage of the outdoors--for that heritage offers physical, spiritual, and educational benefits, which not only provide a better environment but help to achieve other national goals by adding to the health of the nation. 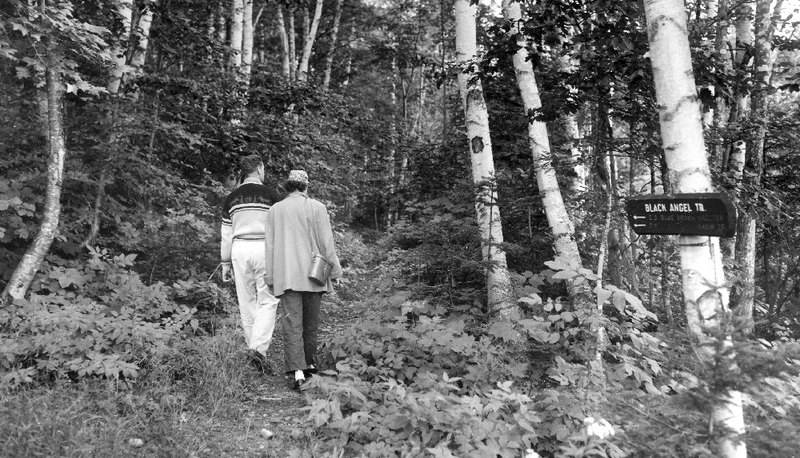 Hikers on the Black Angel Trail, White Mountain National Forest, New Hampshire, 1958. In direct response to the findings of the ORRRC, President Johnson gave a speech on February 8, 1965.10 In it he called for a national system of trails, as well as a national wild rivers system and for full funding of the Land and Water Conservation Fund. A national trail study was begun and the resulting report, Trails for America, was published in 1966. Congress passed the National Trails System Act in 1968 with this intent. During the 1970s, recreational use of national forest trails reached new levels of popularity. By 1976, the Forest Service was spending $5.7 million on trail maintenance and more than $3 million for trail construction each year. A trail assessment underway in the 1970s suggested that approximately 50 percent of all trail miles were not in adequate condition. The Forest Service's 1977 statistics showed more than 10.5 million visitor-days on a 97,000-mile trail system (a visitor-day equaled one visitor for a 12-hour period). With the increasing popularity of its trails, the agency was also finding increasing numbers of user conflicts - between backpackers and horsepackers, for example, or motorcyclists and hikers - as well as needs for more trail maintenance, visitor education, and improved trail design. 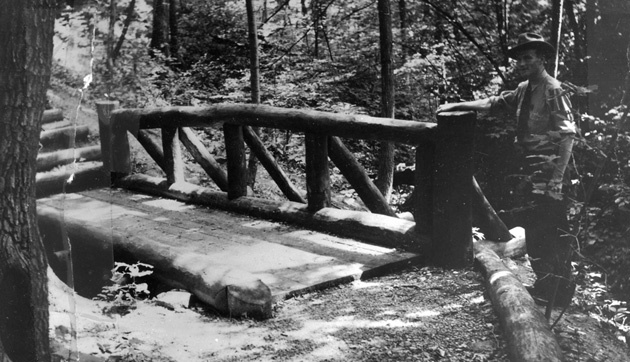 Footbridge at Tinker's Cave Recreation Area, Wayne National Forest, Ohio, 1937. Forest Service chief John McGuire pointed to many of these issues in a 1977 speech: "When most National Forest trails were built, utility and speed were the prime considerations - not esthetic appeal or quality of the recreational experience. Often, trails were located along canyon bottoms to take advantage of flatter ground and easier construction. Many are snowbound early and late in the season, susceptible to erosion, and costly to maintain. They also provide little opportunity for scenic vistas, and sometimes lie in the paths of avalanches." The United States has only about 100,000 miles of trails--less than one yard of trail per citizen. Give thanks that not everyone hikes and that hikers do not hit the trail at the same time. If they did, they could all hold hands. McGuire proceeded to emphasize that public demands on trails could cause problems. "Nor were these trails designed for all-comers. They were generally meant for occasional use by experienced people and pack and saddle animals. Motorized vehicle use was not anticipated. Nor was safety a great concern. Nor was the sheer volume of use that we see today. 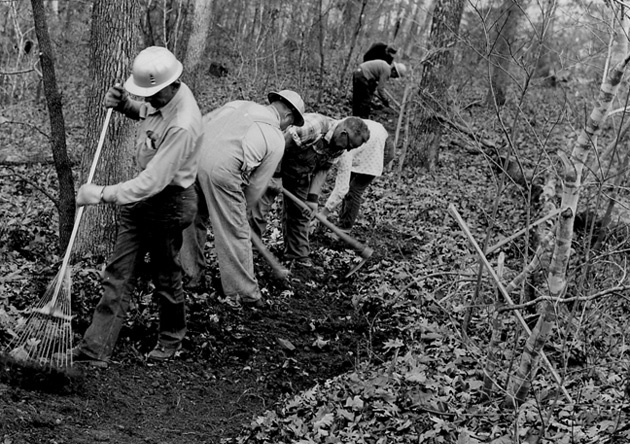 . ."
Accelerated Public Works (APW) workers constructing nature trail, Mark Twain National Forest, Missouri, 1963. Concerns about the condition of existing trails and the large backlog of maintenance in the late 1980s prompted the Congressional Subcommittee on National Parks and Public Lands, Committee on Interior and Insular Affairs, to request the General Accounting Office (GAO) to review the issue of deferred maintenance on Forest Service trails. The committee chair felt that deferred trail maintenance was resulting in the loss of valuable recreational opportunities to the American public, as well as a financial loss of capital investment. In 1991 hearings were held by the Congressional Subcommittee on National Parks and Public Lands on the management of America’s recreational trails. A statement presented to the subcommittee by the associate deputy chief of the National Forest System highlights the agency’s dependency on public-private partnerships to expand and maintain recreational trails under their jurisdiction.18 The partnerships included volunteers, hiking clubs, and local governments and businesses. 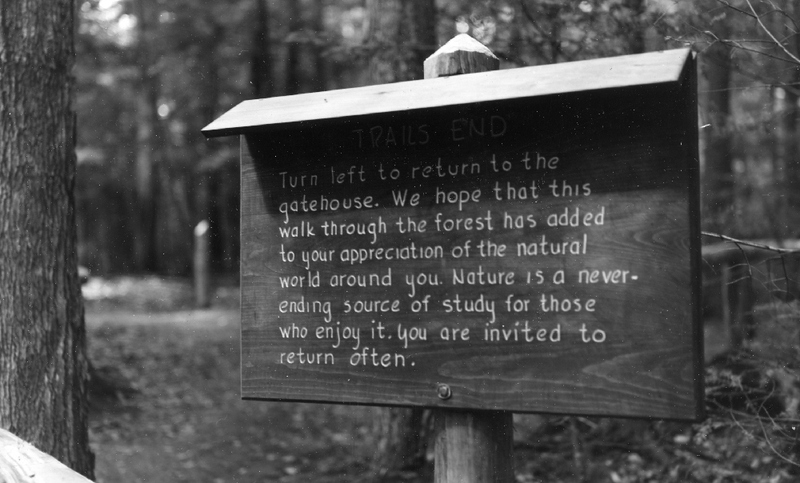 Trails End sign at Dolly Copp Forest Forest Nature Trail, 1962. Additional information on hiking and trail building in the national forests can be found using the Forest History Society Research Portal as well as additional webpages on recreation in the national forests, hiking, backpacking, the national trail system, and the long trails. Written by: Nancy C. Nye, special projects, Forest History Society. Roth, Denis M. The Wilderness Movement and the National Forests: 1964-1980. [Washington, D.C.]: U.S. Dept. of Agriculture, Forest Service, 1984. Roth, Denis M. The Wilderness Movement and the National Forests: 1980-1984. [Washington, D.C.]: U.S. Dept. of Agriculture, Forest Service, 1988. U.S. Forest Service. Trail Construction on the National Forests. Washington, DC: Government Printing Office, 1915. U.S. Forest Service. Forest Trail Handbook. Washington, DC: US Department of Agriculture, Forest Service, July 1935. U.S. Forest Service. Backpacking in the National Forest Wilderness...A Family Adventure. Washington, DC: US Department of Agriculture, Forest Service, 1969. 1 US Forest Service. Trail Construction on the National Forests. (Washington, DC: U.S. Department of Agriculture, 1915), 8. 2 Manuscript, "The Timber Production War Project," Forest Service History Collection, Forest History Society [no date, no author]. 3 Manuscript, "Forest Roads and Trails: Aerial Surveys," Forest Service History Collection, Forest History Society [no date, no author]. 4 US Forest Service. Trail Construction on the National Forests. (Washington, DC: U.S. Department of Agriculture, 1915), 8. 5 US Forest Service. Trail Construction on the National Forests. (Washington, DC: U.S. Department of Agriculture, 1922), 5. 6 US Forest Service. Trail Construction on the National Forests. (Washington, DC: U.S. Department of Agriculture, 1922), 6. 7 US Forest Service. Report of the Chief of the Forest Service. (Washington, DC: U.S. Department of Agriculture, 1933), 28. 8 Maughan, Kenneth. "Recreational Development in the National Forests : A Study of the Present Recreational Use and a Suggested Plan for Future Development Together with a Recreational Management Plan for the Wasatch National Forest, Utah," Bulletin of the New York State College of Forestry at Syracuse University VII (May 1934): 97-98. 9 Olson, Brent A. "Paper Trails: The Outdoor Recreation Resources Review Commission and the rationalization of recreational resources," Geoforum 41 (2010): 447. 10 Johnson, Lyndon B. "Special Message to the Congress on Conservation and Restoration of Natural Beauty," speech, February 8, 1965, accessed October 24, 2014. 11 Public Law 90-543, 90th Congress, S 827, October 2, 1968, "To establish a national trail system, and other purposes." 14 "National Trail System Facts and History," American Trails, accessed October 24, 2014. 15 Cordell, H. Ken. Outdoor Recreation Trends and Futures: A technical document supporting the Forest Service 2010 RPA Assessment, Southern Research Station, USDA Forest Service (2012), 33-35. 16 "National Forest Trails," Wilderness Society, accessed October 22, 2014; and Rob Burbank, "Trails in Trouble," Appalachian Mountain Club, accessed October 22, 2014. 17 Parks and Recreation: Maintenance and reconstruction backlog on national forest trails. Report to the Chairman, Subcommittee on National Parks and Public Lands, Committee on Interior and Insular Affairs, House of Representatives, United States General Accounting Office, 1989, accessed June 23, 2015. 18 Henson, Larry. "Concerning Recreational Trails in America, October 31, 1991, Statement of Larry Henson Associate Deputy Chief, National Forest System, Forest Service, United States Department of Agriculture, before the Subcommittee on Energy and the Environment; Subcommittee on National Parks and Public Lands; Committee on Interior and Insular Affairs; United States House of Representatives," 1991, Forest Service Collection files, Forest History Society.